Thoughts from Carl Grant: Do you see what I’m saying? Why Libraries should be embracing virtual reality. Do you see what I’m saying? 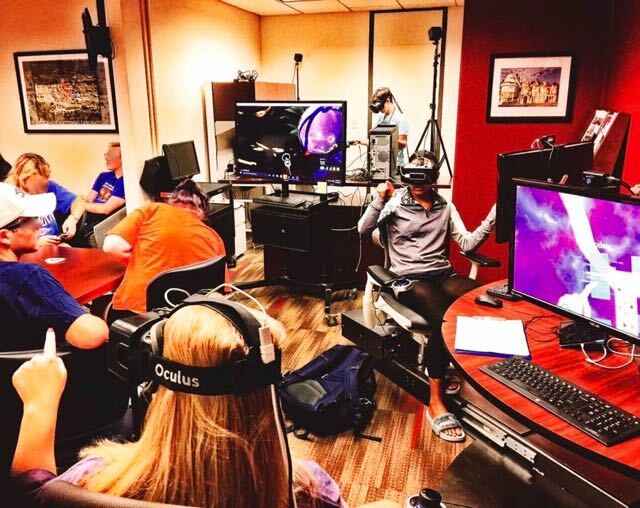 Why Libraries should be embracing virtual reality. 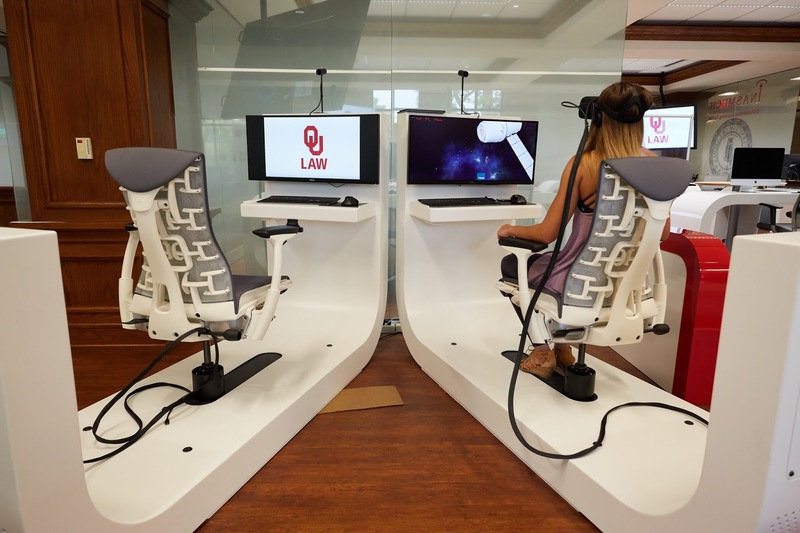 Here at the University of Oklahoma Libraries, we introduced Virtual Reality (VR) to our community with the Galileo’s World Exhibition. I fully expected VR would be of interest to many of our younger exhibition attendees. However, I was certain we were on to something much bigger, when in giving tours of the exhibition, I found myself regularly helping elderly people into the station where we were doing the VR demos, in order that they too could see the Universe as Galileo thought it existed, and then letting them compare that to a VR demo we'd created of the Universe as we know it exists today, using images we obtained from NASA. Watching people light up as a result of that virtual reality experience, no matter their age, really made an impression on me. We then decided to grow our virtual reality activities by taking the technology under wing at our Innovation @ the Edge facility. Next we started the Oklahoma Virtual Academic Laboratory (OVAL) which included the installation of workstations designed specifically to support VR using Oculus Rift technology and to show our community of users how we could support their use of this technology within the pedagogy and research at our University. Since then we’ve grown the program to embrace HTC Vive units and high-quality Google Cardboard headsets. We also assembled a team of Emerging Technologists who have a burning passion to introduce this (and other leading-edge) technologies to our community. 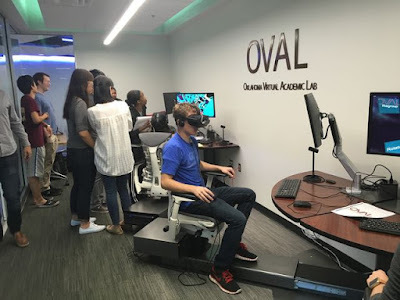 The combination of these things has resulted in us seeing instructors from over 20 courses, and from a variety of colleges across the campus, that have built exercises into their courses that require the use of the virtual reality units in the library labs. In addition we’ve seen numerous other community explorations of the technology, some of which will leave you in total awe of what is possible and being done (some of these have literally brought me to tears they are so moving, but let's keep that as a subject for a separate, future post). All of this has been tremendously rewarding because it not only builds traffic in the libraries, it positions the library as the point to engage with, learn about and experience leading-edge technologies. At the same time, it also allows us to connect the users with the many other resources and users of the library that will help facilitate their thinking and adoption of these types of technologies. (Note: All of this underscores our positioning as the “intellectual crossroads of the University”). Plus, it’s clearly going to lead to higher-level learning and research outcomes as we study the use of the technology and learn from those studies. As wonderful as all of that is, those are not the only reasons I see for Librarians to embrace virtual reality. Recently I was sitting in the airport, waiting for a delayed airplane (an unfortunately frequent occurrence in my life) and heard a nearby grandmother trying to explain something to her grandchild. As she was doing so she was frequently interjecting the question: “Do you see what I’m saying?” It occurred to me, that question was a rather perfect encapsulation of what I wanted to describe in this post. Let me explain. This is all related to what I’ve previously written about in that Librarianship is about knowledge creation. 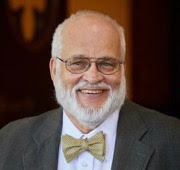 David Lankes is probably one of the most recognized speakers on this topic and has written many wonderful columns on his blog, some excellent books and given many, many speeches that touch on this topic. I consider his work among the best available today on this topic. Of course we, as librarians, are not only about knowledge creation, we’re also about how to transmit the information upon which that knowledge is based, from generation-to-generation and how we then render it in ways that the next person to encounter that information can turn it into similar knowledge or improved knowledge in their minds. Now, admittedly information comes in many containers today, from the web, to audio, to moving images to books. The point is that information comes not only as symbols on a page, but also includes sound, tactile, and certainly additional forms of visual transmission beyond that of just symbols on a page. 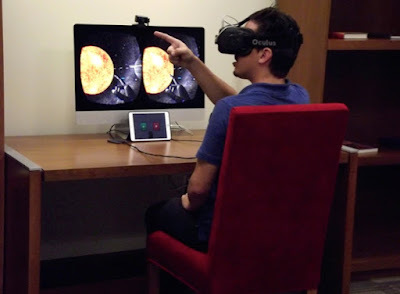 This is where virtual reality comes into play. For the sake of clarification, let us take a short aside. The difference between “information” and "knowledge" is an important one and yet I find the terms are often used interchangeably and I think quite mistakenly. As a point of clarification, I believe information is conveyed understanding and serves as input to thinking organisms where it can result in the creation of the same, new and or different knowledge, but hopefully at least the same knowledge. In other words, to my way of thought, knowledge only exists in thought, be that human or machine. Knowledge committed to transmittable forms, whatever they might be, are to my way of thinking, information that is a result of the knowledge they now have created and/or possess. Knowledge is defined by Merriam-Webster as: “information, understanding, or skill that you get from experience or education.” Working with that definition, the part I want to focus on at the moment is that word: “experience.” It will help illuminate why I’m so certain that virtual reality is technology we need to embrace. History tells us that early humans conveyed information experientially, i.e. verbally or visually and in early times, via drawings/paintings. The means of conveyance was later expanded to include the written word. Over time, recorded sounds, video and other formats were added. Reading is of course, for most librarians, the most endearing and longest running form of conveying information. We deeply appreciate the value that reading provides in our lives, both from the ability it gives us to experience new knowledge, be better informed and educated and thus to improve our lives, but also because it can entertain us. Now step back and think about reading for a moment. What makes a book memorable when you read it? In doing so, you’ve consumed probably hundreds of pages of print and in some way, when you were in that act, you might have felt moved by that text. Maybe it was an emotional experience or maybe it was one of enlightenment or understanding. I often say there are “Aha!” moments, those moments when a switch is flipped in your brain and you find that you’ve identified with the writer, seen the world through their eyes and experienced their understanding. You then possess new knowledge as a result. I totally agree with that and yet not all people are text-based consumers of information. A September 1, 2016 Pew Report tells us: “65% of Americans have read a print book in the last year” and that “(28%) have read an e-book”. While those are not horrible numbers, it does indicate there are still large segments of the American population that are not reading, not experiencing the information needed to create new knowledge and thus likely have become somewhat stagnant in their learning. Or they become easily subject to the “post-factual” society that we all now find ourselves wrestling with (as well as some of the horrendous outcomes that have resulted). So, is there something we can do to move the needle back in the "reader" direction? Well, let’s go back to that grandmother’s comment: “Do you see what I’m saying?” Virtual reality can be another way to help people experience, i.e. “see” that type of virtual place that many of us experience as a result of reading. VR is engaging in part, because it’s so very life-like. It’s enlightening because we can use it to convey information and provide enhanced learning just as we’re doing here at OU’s Libraries. But for people that haven’t learned to read in their youth miss out on a great deal. Basic reading skills need to be developed by age 8-9. Trying to create a reader later than that is extremely difficult. Yet, many students arrive on the doorsteps of a typical University without that skillset in place. Many adults live their lives without this ability. VR gives us the possibility of filling that gap. For instance, what if we took publicly, out-of-copyright works that are available as full-text and downloaded some of those, and then what if we could write code to match up terms in a text with VR models that would illustrate those what those terms mean? Doing so in such a way that when a reader is working their way through a text (in a VR headset), they could pause, point to that link and have the VR model play. For instance, the word "Paris" might appear in a text. What if we could then allow the reader, who’d likely never been there, to take a short 2-3 minute video tour of Paris, i.e. one where they could choose walkways to follow, and explore at will? Imagine if they could do that with a large number of the phrases/words in a body of text. Would that result in their beginning to understand the kind of visualization that reading creates for others who learned those skills at an early age? I’m not certain and there is much to be done to test this idea, but I think it’s worth pursuing. Think about how this could transform community members’ lives. Think about how you, as a librarian would feel, if you helped someone who didn’t think they wanted to, or couldn't read, learn to experience what we has librarians have experienced all of our lives as a result of reading?